Located just a short walk from the cathedral and Piazza dei Consoli, this four-star rated hotel is housed within a building dating, in parts, to the fourteenth century. 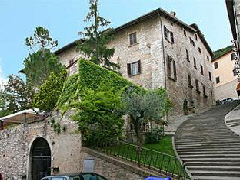 Originally the Rafaelli Palace and home to Gubbio nobility, the place is full of period detail, including frescoes and vaulted ceilings. Indeed, the 14th century poet Petrarch is said to have dedicated a sonnet to the house and its inhabitants. However, arguably the most notable individual connected to the property is Dante Alighieri who is reputed to have once visited. Today, Hotel Bosone Palace offers thirty guest rooms in all (including two Renaissance Suites) and bed & breakfast accommodation.